The new Google AdWords interface has been around for a few of months now. While at first I was hesitant to make the switch over, I eventually made the jump and now I’m starting too really like it, as do others. There are a few aspects I miss about the old interface (the Statistics drop down menu, faster loading times), but the new interface definitely has its pros. In my opinion, one of the best new additions to the interface is the integrated Search Query Report. 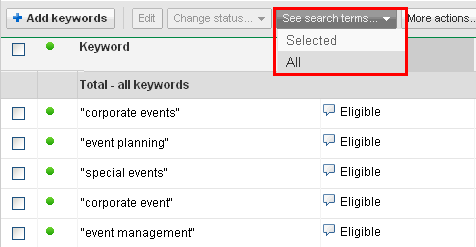 Now, instead of going into the Reports Tab, you can simply navigate to an ad group (or look at the entire account) go to your keyword tab, select the keywords you wish to run the report for and then click the “See Search terms…” dropdown. AdWords will then display a pop-up of the search query report for your selected keywords, in real time. From there, you can see what search queries your selected keyword triggered, and easily add or negative out that keyword from your campaign. Last month Google even got rid of the “other queries” bucket that previously encompassed all search queries that did not generate enough clicks, thus leaving out valuable search query information. Why is this so great? Aside from the fact that it gives you great insight into what visitors are searching for surrounding your keywords, it makes the whole process of running the report much more efficient. No longer do you have to go in to the reporting tab, run the search query report, wait for the report to process, and possibly export the data into a spreadsheet. Of course, if you ever needed to do that it is still an option. So far I’ve used the new search query report for several clients now and I’ve been hit with interesting, funny, or surprising results. Each time I’ve taken these results and utilized them to improve the campaigns. 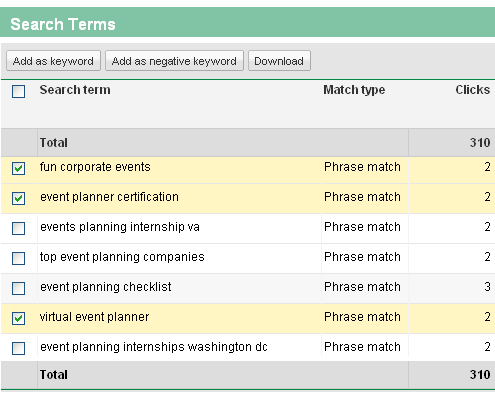 If you haven’t run the new search query report on your campaigns yet I strongly suggest doing so. Who knows what you may find!